Our first stop was Legoland. It's a little different than most attractions because we had to sign up for a time online (I picked 2:00 p.m.). It helps control the crowds - only a certain number of people can be in there at once - and keeps the waiting time to a minimum. We were pleasantly surprised that there were very few people there on Monday afternoon! We never had to wait in line for anything, which was awesome! I didn't know what to expect at Legoland - their website doesn't really say much. I've heard from others that it was okay, but not that exciting. Well, my kids loved it. We ended up staying over 3 hours because they kept wanting to do things over and over. It probably helped that it wasn't crowded, so they could run around and do whatever they wanted! 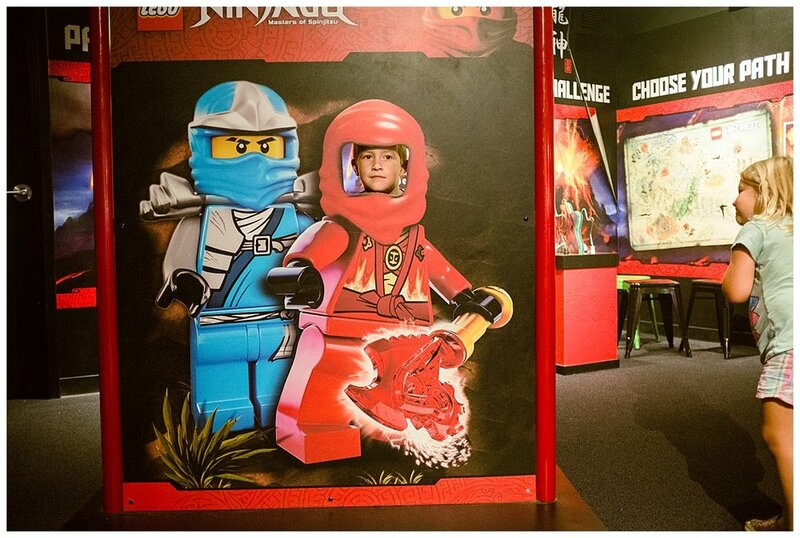 The Ninjago area was probably their favorite - the speed test where they had to hit colored lights super fast was really fun! I beat Curtis by about 5,000 points. The girls were less than impressed with the Lego Friends area...it was just a bunch of "girl" colored legos inside a "house". I really hoped there would be more since I love Lego Friends! There was one room with Lego models of Kansas City landmarks. I was highly impressed by the level of detail each build had! Kauffman Stadium was pretty cool, but the Wizard of Oz display was my favorite. There was even a melting Wicked Witch of the West! The rides weren't much more exciting than the rides at the fair, but of course, the kids loved them! A favorite was the Master Builder Academy - they give you a box with pieces and instructions and time how long it takes to build it. I think I have my own Master Builder - he put this set together in 6 minutes. It's comparable to a $5.99 set...I need to remember that if I buy him a little set, it's like $1 per minute of fun! Ha! The one thing the kids are still talking about is the 4D short movie. It was pretty cute, but who knew that the only difference between 3D and 4D is that they shoot water at you. We got a little wet! No pictures of this because I was busy getting sprayed with water and snow! After we finished at Legoland, we headed across Kansas City to Great Wolf Lodge (only taking the wrong turn once). This was our first time staying there and it was pretty impressive! I've looked at going before, but we weren't going to pay $300+ a night. Great Wolf Lodge had some specials running, so for one night we ended up paying just over $200. Not too bad for a place to sleep and several hours of water park entertainment! The older kids LOVED it. There was a smile on their faces the entire time we were there. The little one...well...she spent most of the time sitting at a table playing with her little animals. From what I could see, kids ages 5 or 6 and up had the best time. There actually isn't much to do for toddlers...we spent some time playing in the shallow area, but that wasn't any more exciting than our town pool. The slides were awesome! There were three of them that had tubes to sit on and those are my favorites...just crazy enough to make it fun, but I never got too wet! Again, we picked a great time to be there, because there were no lines for anything and we never felt crowded. Curtis had a great time too - especially trying out all the water features on the fort. I had FINALLY convinced the youngest that she could try climbing on the fort...then Curtis spilled a bucket of water on her. That ended that. She was absolutely terrified of the bucket that dumped gallons and gallons of water every 5 minutes (I was pretty scared of it too!). Every time it started dinging, she would back up even if she was already 40 feet from it. I finally got her to play in the toddler pool for awhile and we had a good time once she forgot about the bucket.